TALLAHASSEE, Fla.—In recognition of National Volunteer Month, Attorney General Ashley Moody is highlighting Seniors v. Crime volunteers. Seniors v. Crime is a special project of the Florida Attorney General’s Office. Hundreds of volunteers called Senior Sleuths work through the program to assist the Florida Attorney General’s Office and local law enforcement with civil and criminal investigations. According to the Seniors v. Crime Annual Report, Senior Sleuths worked more than 2,000 cases of reported fraud last year, resulting in $1,146,057 in recoveries. The volunteers are also providing support to the Florida Attorney General’s new Senior Protection Team. For more information about the Senior Protection Team, click here. To report senior fraud, call 1(866) 9NO-SCAM or visit MyFloridaLegal.com. There are multiple Seniors v. Crime offices located throughout the state. For more information about how to become a Senior Sleuth, click here. 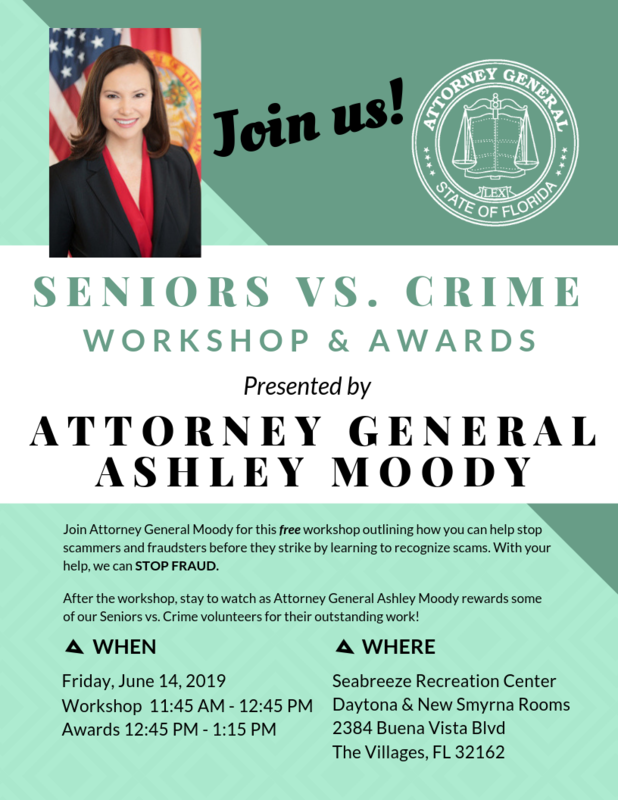 In June, Attorney General Moody will host a Seniors v. Crime Workshop and Awards Ceremony in the Villages. This free event will provide information about spotting scams and preventing fraud targeting older Floridians. Following the workshop, Attorney General Moody will present awards to several outstanding Senior Sleuths taking extraordinary steps to protect Florida seniors. All seniors are encouraged to attend this free event. For more information on the Seniors v. Crime Workshop and Awards Ceremony, click here.